A short blog this time but about another brilliant book by the writing partnership A D Garrett. Believe No One is a great story with DCI Kate Simms and Professor Nick Fennimore at the centre of a crime which strikes a startling resemblance to the disappearance of Fennimore’s wife and daughter some years earlier. The story starts some months after the end of Everybody Lies, and although this book could be read as a stand-alone novel, I would suggest reading the prequel first. Simms is seconded to a multi-agency task force in America looking at the different methods of investigation used in the USA and the UK. The team are looking at cold cases when they come across a link between several Murders, a link which has been missed because of the territorial issues faced by American law enforcement agencies. The more the cases are examined the more similarities are found with the disappearance of Fennimore’s family; but is it all coincidence? Meanwhile another Police Deputy in the States recognises the similarities between a case she is currently investigating and one she had dealt with in a neighbouring County. She contacts Fennimore for help and he heads for America. It is not long before the different investigation teams get together and start to piece together the activities of a serial killer. The narration of the book follows the main 2 characters but the introduction of a third main character, a young boy who becomes a victim of the killer, gives the story an extra dimension. This book is a good read. Again the writing partnership of an established author with a Forensic practitioner has produced a realistic and believable story. At first I was concerned about the ongoing background story of Fennimore’s investigations into the disappearance of his family, in a story which has yet to be told, but now it has me as hooked as one of those cliff hanger season finales on TV dramas. I hope the next book in the series is out soon. I can’t wait to read it. When a fire occurs in the night it’s amazing how few people notice. Driving into a residential neighbourhood there is no warning of the devastation you are about to deal with. The disengaged voice of the sat-nav takes you off the main roads, what few cars are on the roads thin out, shops are replaced by dwellings. The later at night, or earlier the morning, the less lights are on in houses, no people are on the streets. The first indication you get that something is out of place is the reflection of flashing blue lights in the darkened windows as you approach the last turn, or bend in the road. Then out of the peace and quiet you come across twenty or thirty metres of chaos. Fire engines, police cars and ambulances, all with their lights on. The noise of at least one fire appliances engine revving to run the pump. Emergency service crews going about their duty, no different to people doing their daily work chores at two o’clock in the afternoon. Smoke and steam coming out of the affected house, it’s an oasis of activity on a quiet sleepy street. A Blue Light Oasis. I don’t remember making similar observations as a front line firefighter or as the Officer in charge of the appliance. It was probably because I was too involved in what was about to happen, or maybe I’m just getting old and a lot has happened since. Incidents that stick in my mind probably do so for the circumstances around them more than the fires themselves. The first fire that sticks in my mind is obviously the first I ever went into. I joined my watch on its first night shift, and at some ungodly hour we turned out to a flat fire above a shop on a neighbouring area. The first two firefighters, or firemen as they were in those days, had just gone through the door. My partner and I were seconds behind them. The stairs to the flat were clear but the entire first floor was full of thick black smoke, the heat coming from my left was almost unbearable. I can’t remember the exact words of my partner but it was along the lines of “get a move on we’re searching the back”. It got no lighter, nor cooler, for a while. The first team had put the fire out in a kitchen. We had searched the flat, nobody was inside, and opened the windows to ventilate. When I came outside into the cold November night steam rose off me and my three colleagues as if we were on fire. 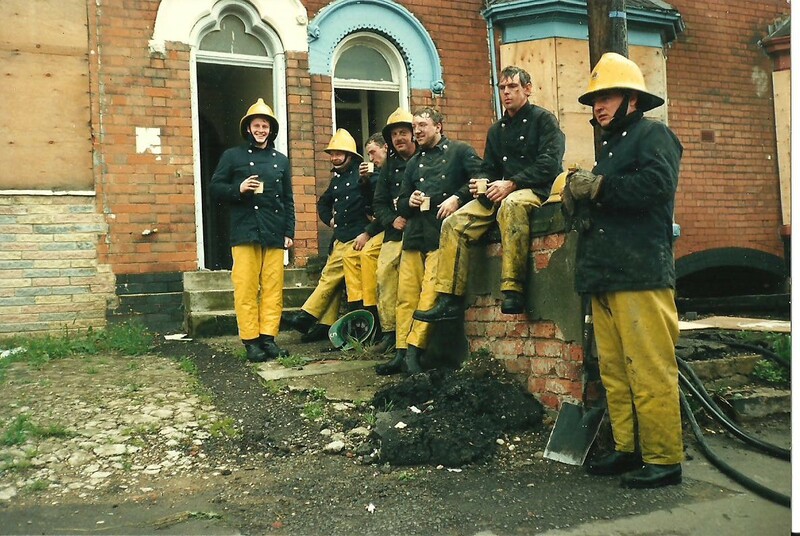 My hands and neck stung from the heat of the fire, no gloves or flash hoods in those days. We were covered in black soot, except for having clean faces where our breathing apparatus masks had covered us. I took my tally from the Entry Control Board and looked at the time. It felt like I’d been inside the building for about 2 minutes. It had been nearly twenty. Over twelve years at one of Britain’s busiest fire stations that was one of thousands of fires I attended as a front line, water squirting, firefighter. How many can I actually remember any of the facts of,Probably less than a dozen. A fire is a fire is a fire unless it’s really unusual. Turning out one night I was riding in the middle, the back seat between the two breathing apparatus wearers, on the back of the second appliance. It was a position which meant I had no laid down duties, the entry control officer sat in the middle of the first appliance. My position that night meant I was the general dogsbody on the fire ground, to most incidents. About half past two in the morning the bells went down to a persons reported maisonette fire about a mile from the station, in one of the roughest areas of Birmingham. En-route we received a radio message from Fire Control stating they were taking numerous calls to the incident and that there was definitely people trapped inside. This was pre mobile phones and numerous calls always meant a bad fire. As we turned off the main road towards the estate we saw flames jetting out of the top window of a four storey block of maisonettes. I had seen fires like this before, and I’ve seen many since, but these were the worst. The flames were jetting at least twenty feet from the window horizontally before curling upwards, it was like looking at a huge welding torch; and this was the rear we were looking at. The appliance took a left onto the estate and a right into the cul-de-sac which led to the courtyard surrounded on three sides by late Victorian built flats which had been converted to maisonettes in the 50’s or 60’s. The flats had a staircase at either end and one in the middle which all served a communal open landing on the second floor. The door to the maisonette was half way between the central and right side staircases on the second floor landing. The door was open and the flames in the hall beyond were floor to ceiling. A window to the left of the door had broken and flames were coming from what I later found out was the kitchen. There was a lot of people screaming at us and through the chaos it became obvious that a little girl was in the rear bedroom, the one from which we had witnessed the jetting flames. We ran hoses out from the fire engines, and got water supplied into them. When that was done and the four breathing apparatus wearers had gone in via the flat door I pitched a ladder, with some of the crew of a third appliance which had arrived, to a small bedroom window on the third floor, directly above the kitchen. Once the ladder was in place I climbed it to be in a position to help any casualties that were brought to the window by the teams inside. That bedroom room was relatively smoke free and I could hear the breathing apparatus teams shouting on the landing outside the closed door so I climbed in and called to tell them there was a safe route out via the room and ladder. They shouted back saying the fire was out in the kitchen, lower hall, and stairway and that they were tackling the fire in the rear bedroom. One of them called it was safe to open the door but that there was a body immediately outside it. I cracked the door slightly, there was no smoke, the maisonette was venting via the rear bedroom windows, a badly burned, and obviously dead man lay slumped against the wall at the top of the stairs. The bedroom where the girl was reported to have been was the most significantly damaged. The fire had been so intense it had gutted the room, spalling the plaster from the brickwork, burning through the ceiling to affect the roof structure so badly that the slates had fallen into the room. It took us an hour or more to remove all the debris and expose the badly burned body of a four year old, still lying within the remains of her bed. It transpired that the little girls Mom was at a party and had left her daughter with her mother. Gran had woken to the sound of something, or somebody in the maisonette. She opened the bedroom door and saw fire so she opened the window and shimmied down a drain pipe leaving her granddaughter in bed. One of the things I really remember was the screams of the young girls mom when she arrived home. I can still hear her wailing for “my baby, my baby”. 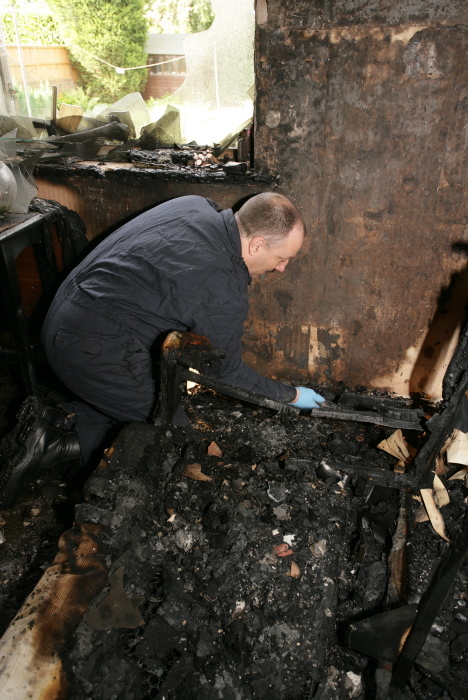 That fire was the first time I met a dedicated Fire Investigator, a new role in the British Fire Services. It was also the day I decided that that was what I wanted to do. The fire? It had been started deliberately with somebody pouring petrol and igniting it with a naked flame. The man at the top of the stairs was never identified and was generally accepted as being the arsonist who had been caught in his own fire. Why did he do it? Speculation was he was the boyfriend of the girls mom, a low level drug dealer who had been selling weed out of her home until he had been recently kicked out by her mother when she found out what he was doing. But around there, at that time, the locals never told the police anything. The first fatal fire I attended sticks in my mind for the simplicity of the scene and the tragic story surrounding it. We were called to inspect a public toilet after a woman had been discovered in one of the cubicles with severe burns. The fire was out when she was found and only an ambulance was called by the person who found her. The ambulance took the woman to hospital where she was pronounced dead. We were alerted by the police and went to the toilets to ensure there was no further danger to the building. The smell of burned flesh is one that you never forget but it surprised me that first timed I smelled it. Inside a public toilet, in a park, in inner city Birmingham in 1983 the overriding smell should have been stale urine. It wasn’t. The old lady had walked to the end cubical early in the morning and set herself alight. She knew what she was doing and had obviously planned her actions. The cubical had a window cill, on which was an empty glass, at the side of the glass sat an empty 50cl bottle of whiskey, next to that was a lighter and an empty bottle of turpentine, and hanging by the crook was an old fashioned wooden NHS walking stick. The toilet seat lid was down and there was burned clothing remnants on the floor. If every picture is worth a thousand words. That’s a thousand words that I will never forget. The lady had apparently been planning the act for a few days. The fact she lived alone with no family around her was probably a big factor, but why like that? I will never understand, and in this case why in a public toilet. As a Fire Investigator I attended other self immolation suicides, and all the others had one thing in common. The person always committed the act outdoors. My belief, and that of many others, is that the deceased do not want to damage any other property, or leave a mess in their home for other family members to clean up. The most memorable such case was a young man who committed suicide within the confines of the ruins of Coventry Cathedral, about five metres from the alter. The only call to the Fire Service came from a cleaner in a high rise office block which overlooked the Cathedral from quite a distance away. She phoned 999 and reported a statue on fire within the ruins at about 2 o’clock in the morning. The first fire crew arrived quickly and found a badly burned man smouldering on the stone flag floor. He was obviously dead and they called me out as the Duty Fire Investigation Officer to carry out the investigation. When I arrived the crew and the Police had cordoned off the area leaving the scene inside the ruins intact. A young Scenes of Crime Officer, as they were called at that time, was waiting for me so we could carry out our duties together. It turned out that this was the first incident this SOCO had attended since finishing his training. As myself and the fresh faced SOCO looked in via the gated archway, which was the inner cordon, we looked across the body to the huge empty windows that looked over a sky which was coloured bright orange by the street lamps. It was very likely the spookiest sight I have ever seen in real life. There and then we both agreed that once inside we would not leave the other alone to return back to our vehicles for any kit. The man had undressed and left his clothes in a neat pile. He had used an A4 pad to write a long and expressive suicide note. He had moved close to a drain and poured the contents of a 5 litre petrol canister over his head, having draped a large towel over his shoulders before igniting the petrol vapours. He didn’t move around, he just fell where he stood, as was evidenced by the pieces of skin and towel on the floor around him. There was flash plume which ran from him to the petrol canister which had discoloured the flag stones but was only visible once the photographs had been developed. Empty blister packets of prescription drugs and an empty bottle of Vodka were found near his clothes as was the book he had been reading, one about the Bombings carried out by the allies on the City of Dresden, during the Second World War. Had this affected the place he chose to end his life? I don’t know, but it’s one hell of a coincidence, and at a scene I don’t like coincidences. The scene was really very straight forward, but the surroundings…. It’s still the only fire scene that has ever given me the creeps. The last fire I’m going to talk about for now was one in which a man died. To this day I do not know if it was a botched arson or if he intended to die in the fire he had set. The fire happened in a two storey semi-detached house on a suburban street in Coventry. In relation to most fires of this type it happened early in the night, sometime between 9 and 10pm. I was called to an explosion and when I looked at the incident log I could see that a large amount of calls had been received by the Control Operators reporting an explosion and fire. Messages from the scene indicated that the entire dwelling was alight and that a body had been located. I arrived at the latest Blue Light Oasis about an hour after the first crews, who were still in attendance. Thankfully we have diligent Fire Officers and skilled Fire Investigators because the attending Police Officer corralled me as soon as I arrived and said to me ” it’s obviously a gas explosion lets get it sorted quick and get away”. His shoulders slumped when I explained to him that you don’t get houses fully involved in severe fire immediately after a gas explosion, and that the blast damage was not consistent with a gas explosion either. His hope of returning to wherever he was dressed up to go had just evaporated, along with the petrol that had been used to accelerate the fire. The entire house, with the exception of the kitchen had been badly damaged by fire and heat. The stairway, which rose from the hall, about a metre inside the front door, was so badly damaged that the fire crews pitched a ladder up it for safe access. The ground floor front windows had been blown open but the glass was intact. The ground floor lounge patio doors had been blown out and were strewn broken across the back garden, with several pieces of glass embedded in the timber shed about five metres away from the house. Every window on the first floor had been either damaged by the over pressure when the petrol was ignited, or had been broken by the heat of fire. The very badly burned body of a man was lying face up on the landing across the threshold of one of the rear bedrooms. At that time fire debris covered all but his head, knees and forearms. The heat had forced his body into the pugilistic position in such a severe way his wrists had snapped and the bone shone white in my torch light. Once the debris was removed, to expose the rest of the man, it became evident that his leg was through the rungs of a loft ladder. The ceiling had burned through but the larger joists had survived in places and it was possible to identify the hatch had been in the hall above where the body lay. Working with the Forensic Scene Investigator, as they are now called, I excavated around the body and we were happy that there was no obvious pre-fire injuries before the body was removed. I asked for the attendance of the Fire Investigation Dog Team, a specialist team of dogs which can locate minute traces of hydrocarbon based fire accelerants, and started to record the scene. Two empty petrol containers were in the rear garden, but above the remains of the patio doors, indicating they had been blown into that position during the deflagration, and therefore were inside the lounge when it happened. Preserving the scene was difficult due to the severity of the fire. Digging out would have destroyed evidence so small pockets of fire kept igniting as some deep debris smouldered. This is a problem almost unique to fire crimes where leaving the scene undisturbed can actually lead to evidence being destroyed. Allowing a very controlled amount of water to be applied to these areas can put the fire out, but balance that against swilling away what might be the last evidence of an accelerant is a headache all fire investigators encounter. In this case, as in all the cases I have used the dog team they came up trumps indicating that an accelerant had been liberally splashed throughout the house, except for the kitchen. The investigation, into the cause of the fire took two days. Even if the cause appears obvious from the start all diligence has to be made to ensure it is correct, and that all other sources of ignition are eliminated. Why was this fire memorable? Two reasons; all of the Police Detectives that attended at the beginning of the investigation were obviously at an event as they were called. The Detective Constables were in evening dress, as was the Detective Sergeant and the Detective Inspector when they arrived. I will never forget the DI’s face when I asked him if he wanted to enter the scene. Lots of posh frocks and suits got very smelly that night. The second reason was earlier that evening a good friend of mine had just been told he’d secured his dream job as a Fire Investigation Officer. He was in charge of the first crew to relieve the crews who had extinguished the fire. When he arrived he was all smiles. When I passed him the camera and told him to go inside and start recording the scene I saw terror in his eyes for the first and only time. Within five minutes he was photographing everything and the smile was back. He remains to this day one of the best FI’s I’ve ever worked with.